About an hours drive east of Lago Petén Itzá lays the tranquil Maya ruins of Yaxhá. Situated deep in the jungle and bordering Laguna de Yaxhá, the Parque Nacional de Yaxhá-Nakum-Naranjo is a stunning addition to a trip to Tikal, or if you are looking for less-touristed Mayan temples, a grand alternative to it altogether. 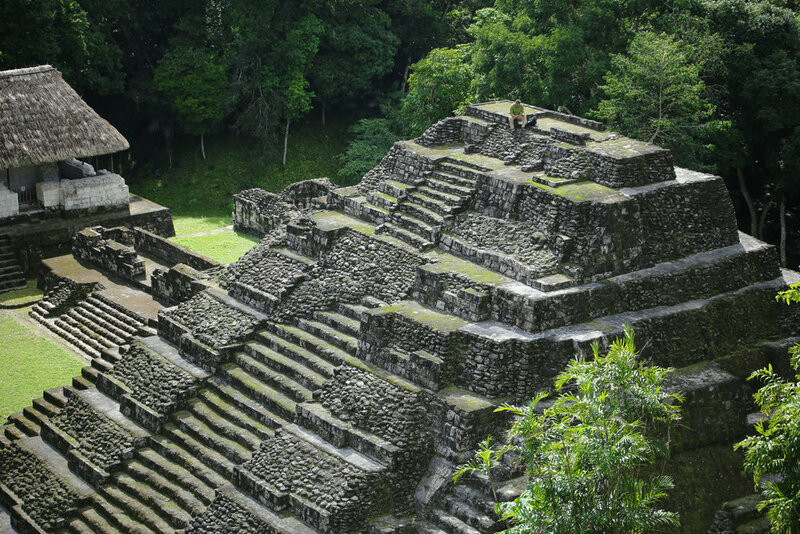 Built and occupied during the Preclassic and Classic eras of Maya civilization, Yaxhá is the site with the third largest temple in Guatemala, behind only El Mirador and Tikal. Laguna Yaxhá from a mirador (lookout). Yaxha hosts three miradores, viewpoints, above the jungle canopy in which you can view the lake, hills of the area, and even some other temples. It's just exquisite. With few visitors (we saw about 10 in total the whole day), the park is nearly yours to discover. Plenty of park interpreters are present to answer questions (in Spanish) and guides are available at the entrance. Howler monkeys, spider monkeys, and toucans are more plentiful here than in Tikal I found, and were at every turn in the forest. Likely bothered by the scent of another male, one of the monkeys even tried to poop on my father! Howler monkey perched in the jungle canopy above. View above the canopy of the North Acropolis. The park was ever tranquil under the massive dense forest with winding pathways and staircases. It's more compact than Tikal, which allowed us to see it all in about 3 hours and have time to relax with a few Gallos (national beer) lakeside at the beautiful eco-lodge of El Sombrero. At the time of writing, it's worth mentioning that there is free camping offered within the park at a beautiful location next to the lake. Risen water levels of Laguna Yaxhá. Laguna Yaxhá from Temple 216. From El Sombrero, you can take a lancha, small boat, to an island within the middle of the lake called Topoxte. While the ruins aren't nearly as grandiose as Yaxha, to ride in the boat across the lake is just beautiful. Did I mention there are crocodiles? Lancha approaching the island of Topoxte in Laguna Yaxhá. Artistic rendition of Topoxte civilization in its grandeur. If you're looking for a place to quietly contemplate the incredible and largely uncovered works of the Maya alongside a stunning lake, this is the spot for you. Myself in the jungle around Topoxte.